Tamales and Gumbo is an Urban story about Gloria, a beautiful Chica, and Malik, her African-American boyfriend. A madly-in-love Malik finally proposes to Gloria in front of all the guests at their 3-year anniversary party and, much to the dismay of both their families, Gloria excitedly accepts. How will Gloria and Malik survive the hilarious cultural clashes and other trials and tribulations that surface on their way to their big day? Will their families relent and embrace their marriage? 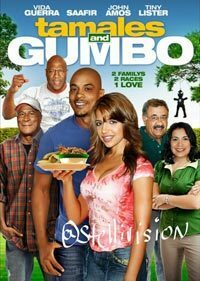 See this film and witness the coming together of “Tamales and Gumbo”.